In what some are calling “the patent trial of the century,” a federal grand jury in California last week decided in favor of Apple in a patent infringement lawsuit against Samsung. In addition to awarding Apple more than $1 billion in damages, the jury found that Samsung violated several iPhone utility and design patents when it created phones such as the Galaxy S II and the Fascinate. Following the verdict, Apple requested that eight Samsung phones be banned from sale in the U.S. A hearing on the matter has been scheduled for December. In the meantime, Samsung has said it will appeal the case. Many observers believe Friday’s verdict could open the door to Apple pursuing litigation against other companies — including Google, maker of the Android operating system used in Samsung phones and tablets. To discuss the key issues of the case, Knowledge@Wharton turned to Wharton management professor David Hsu and Wharton legal studies and business ethics professor Andrea Matwyshyn. Edited versions of both transcripts appear below. In the first conversation, Hsu talked about the case’s impact on innovation as it relates to design and creativity. Knowledge@Wharton: David, first of all, could you tell us some of the winners and losers as a result of the jury’s decision? David Hsu: Apple is the clear winner here, and the device makers on the Android system are the ones that are going to be scrambling and trying to figure out in what areas they’re going to have to retrofit, or even redesign, their products. Of course, Google is kind of the company lurking in the background — it isn’t being attacked directly, but it’s getting closer [to being directly impacted]. My interpretation of why Apple leadership was so insistent on pursuing this case to the end is because they feel strongly that the design elements in conjunction with the functional elements of their products really make the user experience, and they want to protect that. As a result, the likes of Samsung, HTC, Motorola Mobility (owned by Google) and the other large handset makers on the Android platform are the ones that will be trying to figure out their next moves. Knowledge@Wharton: Are there other winners besides Apple? I know there’s been some discussion that Microsoft, which makes the Windows mobile operating system used in Nokia devices, could get a boost from this decision because their product is so different from Apple/Android. Hsu: I think that may be true in that this opens up the landscape of competition beyond just the functionality. Maybe it would be useful to take one step back and to analyze the patents that were under dispute here. A number of them were on the design side, so it’s not protecting the functionality of the innovation, but rather the packaging of it. And then a few of the others did not go to the core of the operating system, but were about some of the more design-oriented aspects, [such as] the [feature in which pages viewed on Apple’s iOS operating system “bounce back” into place when a user reaches the top or bottom] or the array of the icons on the grid. I interpret it as a strengthening of design-related patents. Previously, it was the case that if you were a furniture designer and came up with an innovative design, that did not necessarily stop competitors from coming in and marketing say, an “Eames-like” chair, so long as they were clear that it was not the genuine product. [The Apple/Samsung case indicates] that there seems to be a broadening of the protection of design elements. And so this, I think, broadens the landscape for how companies — including electronics companies or fashion design companies — will seek protection of their creative efforts, their intellectual property. For the direct competitors in the handset space, [the implications] will play out in terms of acquiring patents, as we’ve already seen over the last two years or so. There has been lots of interest in trying to acquire whole “patent portfolios” that surround smartphones. Obviously, the smartphone is going to be the Swiss Army knife of the 21st century — it already is, and is becoming more so. And as a result, there is almost a land grab for the various kinds of more elemental patents in intellectual property that undergird that platform. So to summarize my answer, I think that this case will broaden the landscape of competition. It may open the landscape a little bit more. You mentioned Nokia and Microsoft, and clearly they have their own operating systems for the smartphone hardware, and they may be kind of waiting on the edges. But it is pretty clear that the dominant competition, at least right now, is the Android versus the Apple operating system. So this is why the case was billed “the [patent] trial of the century,” as a result of the two large manufacturers going head-to-head in this battle. Knowledge@Wharton: So you don’t think that one impact will be Nokia and Microsoft immediately elbowing out Samsung, HTC, Google and the rest of the Android-based phones? It would be for the number one space, since Apple phones are really number two in the U.S. market. Hsu: No, I don’t think that this is going to radically reconfigure the landscape because in this kind of platform-oriented competitive space, there tend to be tipping points. And there has to be enough of a critical mass of users, a developer community and support by the companies to really enable the critical mass because people are not necessarily just looking at today’s functionality: They’re trying to anticipate the functionality down the road as they decide to adopt one platform or another. While I think that there’s going to have to be some redesign [as a result of this case] — not only in the smartphone market but also in the tablet market, where these operating systems naturally share a common code — what we’re going to see if anything, is perhaps more of a creative or innovative effort by the manufacturers of the Android platform to try to differentiate themselves. But I do think that there’s a window now, a little bit of a window of opportunity for Microsoft and Nokia to take advantage of this particular event. Whether or not they’ll be able to successfully navigate that obviously remains to be seen. Knowledge@Wharton: You just mentioned the potential that this case will encourage more innovation in smartphone design. Patents are intended to encourage innovation, but do you feel that cases like this — where some of the aspects Apple is trying claim as proprietary would seem to severely limit the design and functionality options for all of the other players in the market — can actually have the opposite effect? 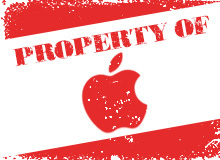 Have we reached a kind of inflexion point with this so-called “smartphone patent land grab” that’s been taking place? Hsu: Let me try to lay out the arguments on both sides. On the one hand, you could certainly think about companies like Apple, which spent many years coming up with the perfect design that might appeal to the users, as just trying to protect that and trying to blockade any efforts [to copy that design]. It’s much more about the symbolic value of what Apple is doing, despite the judge urging the CEOs of Samsung and Apple to try to come to a private settlement. Apple wasn’t interested in that, of course, because they wanted to assert and send a signal to the broader market about trying to protect their efforts. It is true, and I think the Samsung team tried to make these arguments of should it really be the case that the casing of the phone, the rounded corners on the rectangle and the spacing between icons on the grid need to be protected. And we have to keep in mind that there is this distinction between the design patents and the utility patents. The utility patents are much more about the functionality of the phone; the design patents are just about the non-functional elements. These things come together as a package to the consumer. I think we are treading a line a bit in terms of how much protection should we as a society give to the innovators — and we should think about innovation very broadly, not just in the technical sense, but here broadened out to the design sense — balanced against a free market economy in which there is healthy competition that can observe market signals, try to build on top of what’s already been done and basically unlock more value for consumers. As I said earlier, before now, design patents were thought to be fairly ineffective, not really enforceable. Utility patents have always been a domain where companies have really tried to be both offensive and defensive in the patent space. And so this judgment will give companies and managers a reason to start thinking about design as the basis of protection. To your broader question of whether this is good or bad for society, I think it always has to be a balancing act. Whether or not these particular patents being enforced this way will send a chilling signal to the rest of the market remains to be seen because this is just the tip of the iceberg. This is one trial. Apple and Samsung have something like 19 or 20 trials around the world slated. Of course, this judgment will impact how Samsung will put forward their products, as well as others that use the Android system, but there remains in this case an appeal that’s looming, as well as many other jury trials that will be in different jurisdictions around the world. And so I think that this is not necessarily just the beginning, but it’s also not close to the end in terms of this patent war. Knowledge@Wharton: I think I had read that Samsung has said they’re willing to take this case all the way to the Supreme Court if necessary. Hsu: This will actually be an interesting test case for many creative industries, not just electronics or information technology. I alluded to design, fashion, product design, industrial design — all these things tend to be converging and increasingly are differentiated…. I think Apple has shown repeatedly that users care not just about the raw technical horsepower of the product, but also how they interact with it. And so my interpretation of this case is much more about the implications for the design community and protection of creative advances in thought very broadly, not just in the technical space. Knowledge@Wharton: Apple is the winner in the court of law for now, at least, but what about the court of consumer perception? How do you see this affecting Apple in that space, and Samsung as well? Hsu: That brings up a point that I should have probably mentioned earlier, which is that these product lifecycles tend to be fairly quick. We’re used to a new iPhone every year. And while [companies are] not completely abandoning some of the core design, it’s not like some other industries in which one design will rule for decades and decades. And so you wonder why Apple and Samsung took this case all the way to a final judgment … since it’s likely that the design a couple years from now will be obsolete. In terms of public sentiment, Apple has to be a little bit careful. I think this can work both ways. On the one hand, there could be a little bit of a backlash from users saying, “Well, I actually prefer, for example, an Android platform and Apple is trying to assert these rights about how things are laid out, the physical form of the product, in ways that aren’t necessarily novel or that deserve patent protection.” And so [consumers] could be more willing to experiment with some of these other platforms, like Nokia, Microsoft, etc. On the other hand, I could see perhaps some users acknowledging that Apple did spend quite a bit of effort and put a great deal of detail into the design, as well as the functionality, and they should be rewarded for that. Apple has had a blockbuster set of years in terms of their performance on the stock market and the value of their company. There is this danger that maybe they’re going to be perceived as, in some sense, the next Microsoft, trying to come up with one innovation and then trying to blockade everyone, and not allowing competitors to come in and innovate. There is this double-edged sword phenomenon that could work here. Apple has to, as they’ve been doing, continue this pace of innovation, and as I said before, it is this delicate balancing act between trying to protect versus trying to innovate and allowing others to come in as well to try to push the envelope forward. Knowledge@Wharton: Do you feel like this case represents a new strategy going forward for Apple? Apple has always been able to capitalize on this sort of cool aesthetic that’s attached to its devices. Is that put in danger if the company goes into more of a protectionist mode? Hsu: That’s the danger of being the market leader: All of the sudden, they become the targets of all types of consumer sentiments. That was certainly true when Microsoft ruled the day. [Apple] is a company that obviously stresses industrial design, as well as functionality and obsessing over the details. I think consumers have clearly appreciated that. I’m sympathetic to this argument of, now that Apple has been so successful in the market, companies like Samsung coming in and just basically taking everything that it’s done after lot of experimentation doesn’t seem fair. On the other hand, as these types of cases get sharper in the courts of law in terms of protectability versus not, I think what is allowable versus not will become clearer. Before now, it hasn’t been such a big, high-stakes type of enterprise. Now that landscape has shifted a bit. But in terms of the overall corporate image, it’s clear that Apple’s brand and what it means as a brand to consumers is quite valuable. And so this litigation is an effort to try to, in accordance with its late founder, Steve Jobs, defend itself there. But as you allude to, there is this danger that if they become perceived as litigious, or if that part of the company crowds out the more innovative, creative, design-oriented side of things, then obviously it becomes problematic for Apple. They don’t want to lose what’s been at the core of their identity and what’s caused them to become the world’s most valuable company. In a separate interview immediately following the interview with Hsu, Matwyshyn talked about the case’s implications for U.S. patent law and how patents are being employed by companies seeking to protect their inventions and technology. Knowledge@Wharton: Andrea, I’ll start by asking you the same question we posed to David earlier: Who would you say are the key winners and losers from the court’s decision last week? Andrea Matwyshyn: The winners and losers in this decision still remain to be determined. The commentary that’s been running in the press and in academic circles is, frankly, a little divided. On the one hand, the commentators and academics who are very supportive of patent holder rights view this as a strong win for Apple. However, of course, the decision is likely to be appealed. And so the ultimate outcome with respect to the damages award and the crafting of the decision itself may come under scrutiny at a higher level. On the other hand, we have some commentators who are pointing to Samsung getting an indirect kind of market base win in this case with [the decision] highlighting a kind of de facto comparison of similarity between the products that Apple and Samsung are offering. Some consumers may view this in essence as a court saying, “Hey, these are functionally equivalent products.” And then the consumers look at the price point and recognize that one is significantly less expensive than the other. However, I think the big-picture questions that are perhaps most interesting with respect to this case are the questions about the identity crisis that exists in the U.S. patent system and the conversation that we need to have as society about what it is that we’re trying to achieve in our models of innovation and in our intellectual property law. There were many different bases for Apple’s assertion that Samsung was infringing on its intellectual property rights: utility patent arguments, trade dress arguments, they really ran the gamut. And the way that these legal rights are constructed is somewhat problematic. When we’re talking about patent reform — as we are these days in Congress and in society as a whole — this case really kind of brings to the fore and encapsulates some of these legal and policy discussions about different models of innovation and what we’re trying to achieve when we are affording certain individuals rights to enforce limited access to their creations. And, on the other hand, we have companies or individuals who are leveraging that existing knowledge — perhaps overly aggressively, but nevertheless leveraging that existing knowledge — to bring new products to market and potentially offering more choices to the consumer in the marketplace. So this is a broader social conversation that needs to happen, and that’s the big take away here — that the law and social policy and innovation are confused. This is just the first round of this broader battle that’s going to be playing out over many years to come. Knowledge@Wharton: Do you feel that patent law as it exists now is accomplishing what it was intended to achieve? Or has it become a hindrance to innovation? Matwyshyn: That’s the big debate that we need to have as a society. On the one hand, certainly in some cases, affording a patent holder the right to defend their created product means that perhaps more research and development will happen in some cases because companies and individuals will be motivated by the desire for financial gain and to be able to control the creations that they’re making. However, we also know from creativity theory research that many people create not because they’re seeking financial rewards; they create for other reasons. So this bigger-picture question of what we’re trying to accomplish with our legal regimes and whether we’re accomplishing those goals, that’s what I’m really highlighting in this case. The patent system has also evolved across time to include what some commentators view to be problematic players. For example, “patent trolls,” or people who aren’t really using the inventions for which they hold patents, but they nevertheless seek to enforce the rights that pertain in connection with their granted patents. So some commentators view these patent trolls as being part of the problem. And although they technically have the legal rights to enforce these patents, they’re not necessarily adding value to the business space because they’re not bringing new products to market; they’re not really actively using the rights that they hold to research and develop in new directions. Knowledge@Wharton: The decision has prompted some outcry over Apple seeking to enforce patents that would seem to severely limit competitors, such as the shape of the phone or the way you move your fingers to zoom in. Do you feel like this is just another form of being a “patent troll”? Matwyshyn: That’s the debate that I’m pointing to, that you have these different overlapping legal categories of potentially protectable interests. And it’s not clear which of these categories necessarily pertain in all cases. There’s a debate over whether the way that technology related patents are currently granted is simply not sustainable in the long term. There’s a debate over whether the types of patents that you’re pointing to, the utility and design patents, whether those should even be protectable through patent law. Maybe they’re better protectable through copyright…. It’s not clear that we have optimized the balance between giving innovators the right to defend their products and simultaneously offering the marketplace more product choice by allowing for building off of those products. These two parties, Apple and Samsung, have approximately 50 rounds of litigation going on in various different forums throughout the world, so this battle is an epic one that spans continents, not merely the U.S. courts. Another interesting wrinkle in this particular relationship is that apart from the drama of the scope of this legal battle, there was a failed attempt to license some of these technologies that existed prior to the filing of some of the litigation. So we have this discussion also in terms of should we be encouraging parties to collaborate more and to share their technologies? And are there ways to create incentives for licensing of technology, rather than having the result of tension in the technology space end up in the courts? It’s not always a socially or even individually efficient solution to have people going to court all the time. Lawyers are expensive. Judicial resolutions to these kinds of questions take time. Ultimately, that is time that maybe we should refocus toward more research and development, more innovation and the streamlining of the squabbles that exist between players in this space through encouraging licensing and sharing of research, rather than creating legal incentives for people to want to duke it out in courts of law. Knowledge@Wharton: Do you feel that there is the will in the technology industry to do that? David had mentioned in our earlier conversation that the judge in this case had previously, unsuccessfully, urged Apple and Samsung to reach a private settlement. Matwyshyn: This demonstrates the reality that when tensions run high, companies or individuals don’t necessarily see it to be in their best interest to be accommodating of each other and to want to resolve battles. Press reports indicate that Steve Jobs was very upset over the emergence of, for example, some Google [Android-based] products and viewed it as almost a personal betrayal, and that, by press accounts, he was “ready to go thermonuclear” on this situation. When you have inventors’ emotions wrapped up in legal battles, or really in almost any business scenario, it’s not always the case that parties will act in their economic best interests. Humans are not always rational and predictable creatures. And so that has to be factored in when we are analyzing optimal regimes for incentivizing innovation. The other moving piece in this litigation that many press accounts have highlighted, and in particular as jurors are being interviewed by the press [is that] it’s becoming evident that the jury deliberations that happened in this case — although perhaps they weren’t unusual in terms of the quality of deliberation that happens in various jury cases — were a bit rushed and that the jurors did not necessarily fully process the information at the high level of analytical specificity that certainly legal experts would have preferred. Some of the comments that the jurors are sharing with the press indicate that perhaps there was a desire to punish Samsung rather than to obtain a redress for Apple for real economic harms that they had suffered. That, again, calls into question the broader structure of the way that we resolve intellectual property disputes, particularly in a technology context. The question of whether code, computer code, is even patentable subject matter is up for grabs right now in terms of the way the different courts are analyzing these questions. Legal commentators expect to see more action in this space, potentially resulting in the Supreme Court ultimately accepting the case for resolution. Knowledge@Wharton: Moving away from the patent question a little, how do you think the case will affect consumer perception of the companies involved? Matwyshyn: That’s a great question. As I mentioned in the beginning of my comments, there is some discussion of whether this legal process has highlighted the similarity between the Apple and the Samsung products, and maybe some consumers will, in fact, consider a Samsung product now when they would not have in the past. Other consumers might perceive Apple to be acting as a bit of a bully by using courts rather than research and development labs to continue to innovate. Consumers might argue that even if there is recognition [that Apple was behind] a particularly useful mechanism, such as the pinch and zoom method, that they want to have other companies model that winning development, and to build on each other’s knowledge and bring more products into the market. So I think consumer reaction will be mixed. Now of course, there’s a very strong “Apple fan boy” dynamic in the consumer marketplace as well, so Apple supporters will undoubtedly be very pleased with this result. I think it’s a mixed bag all around, and we will have to take a look, again, and revisit these questions in about two or three years to see how the big picture has evolved in this space. Knowledge@Wharton: This case is just one of a number of patent-related lawsuits and moves that have taken place in the smartphone and tablet market. For example, Google’s purchase of Motorola Mobility was widely believed to be motivated by acquiring patents. What do you think this “patent land grad” means for the future of smartphone and tablet design? Matwyshyn: There’s speculation that exists in the press, in part because of what has been reported to be personal animosity that existed between Steve Jobs and Google, that the ultimate target or goal of Apple’s aggressive litigation posture is to ultimately go after Google Android, which has been building market share very aggressively. Attacking or highlighting the manufacturers of the physical hardware upon which Android runs is a way to undercut or slow down Android adoption throughout the marketplace. So the exact outcome of that strategy and Apple’s future relationship to Google are certainly two of the most interesting moving pieces in this broader conversation.